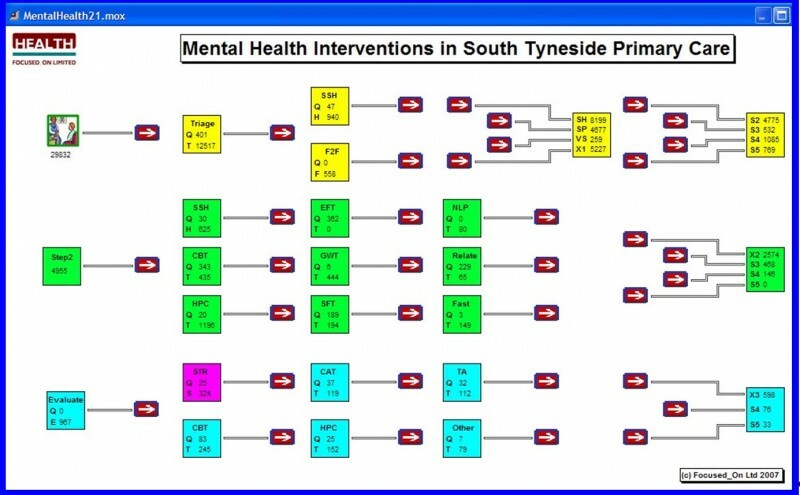 This modelling project was commissioned by South of Tyne Adult Mental Health Services to find new ways of designing processes to achieve better patient flow, deliver greater care, raise staff support, and provide better value-for-money for the delivery of mental health services in South Tyneside. The modelling undertaken by Focused-On Ltd.
Staff moved from paper process maps to PC-based PatientFlow planning. Their drawings linked to source data, reference material plus shift profiles, duration (usually defined as a triangular distribution) of value-adding activities and courses of treatment, and identify which staff and facilities are needed. This phase gave everyone a shared-understanding. Clinical staff were reassured by its “fairness” and it engendered both “integrity & respect”. It also provided a good understanding of the therapy skills within the teams. The resulting simulation FlowModel could then be used to identify and measure likely patient queues and test the impact of organisational changes and the appropriate engagement of services that might be better provided via service level agreements with voluntary sector and other external providers. The PatientFlow plans and the simulation FlowModel are being used very succesfully in collaboration by the local commissioner, the lead GP, and providers to build and deploy their ‘dream team’ of therapists in a way that can meet the 50% increase in referrals within approved headcount and budget. “We have used the PatientFlow Planning software to design and document when and where Therapy Services are going to be delivered as part of our Stepped Care Plan, and this has helped us to secure clinical support at the outset. We quickly gained a more detailed and more rigorous understanding of which skills and resources were currently available and where the gaps in services were, but this in itself couldn’t help us to plan how to optimise the skills and experience of our Staff alongside external Advisors and Counsellors. We have, therefore, used our PatientFlows and the professional services of ‘Focused On Health’ to design and calibrate a simulation FlowModel which means we can actually see the likely impact of our decisions on the process dynamics. Now, we can quickly and easily measure the Queues & Wait Times likely to be experienced by Patients and test the expected benefits of sharply focused recruitment, dedicated Service Level Agreements, and investing in our Staff and deploying their new skills for the benefit of our Patients. 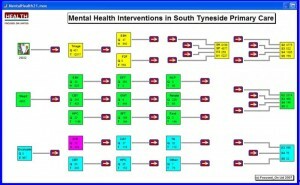 – Terry Prior, Commissioner for Mental Health Services South Tyneside. More information can be found at: www.focused-on.com or contact Steve Burnell.